Kenneth Christmon didn’t tire of signing his name Sunday – he insisted on it. The assistant vice chancellor of admissions at IPFW, soon to be Purdue University Fort Wayne, regularly paused to sign letters of intent as future student after future student did the same during Spring Campus Visit Day. “I will sign every one of those letters,” Christmon said, refusing to let a student walk away with a signature reproduced by a copy machine. A record 877 prospective students and family members participated in Spring Campus Visit Day, which featured department open houses, campus and housing tours, and opportunities to meet with faculty and staff, among other activities. Although high school letter jackets were a common sight around campus, Spring Campus Visit Day gave the future college freshmen opportunities to feel like a Mastodon. Their name tags hung from lanyards emblazoned with the phrase “Go Dons!” and they were invited to autograph a mastodon statue in Walb Student Union. Allie Ogle, who attends Triton Junior-Senior High School in Bourbon, added her name to one of the tusks. There’s no question she’ll attend Purdue Fort Wayne in the fall, she said. Amanda Thompson of Bluffton appreciated the chance to see campus, and her parents saw value in other aspects, such as the financial aid presentation. Her father, Doug Thompson, said the letter-of-intent signing was also nice. “We both enjoyed that,” he said. The positive energy on campus was undeniable, Christmon said. 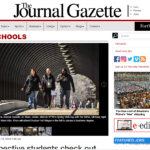 This article originally appeared in The Journal Gazette on Monday, March 19th.